You are currently browsing the daily archive for March 16, 2009. My parents are ALREADY grandparents, but nevertheless this time they are grandparents for the first time to a granddaughter! Hannah definitely has more hair than I did when I was a baby…however it is yet to be confirmed if she looks exactly like me. She does have my long fingers though! Four days after Hannah was born, Pete took Ethan to the San Francisco international airport to pick my parents up. Yup, my folks are here for about a month or so for a visit, and of course to see their two grandkids. Unfortunately Hannah and I could not go along because the Accord we were having at that time could not fit everyone in. Pete and Ethan had to wait for an hour or so in the airport arrival hall and it was quite strenuous too as our lazy little boy insisted that his Daddy carried him most of the time. We were a little bit worried that Ethan would not recognize his Ah Ma and Ah Kong, but he smiled as soon as he saw them. 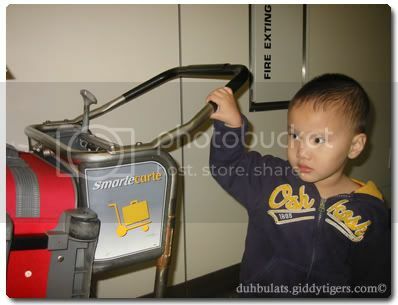 And he was trying to be all helpful, wanting to push the airport cart even though it was way too heavy for him!